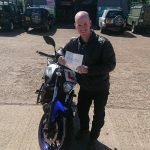 Jarrod Goodwin of Haywards Heath got his full DAS licence after just two days training, day three was full of recap and tests and he passed both first time. I’d just like to say thank you again for the training you guys provided me at the weekend. I am so pleased to have passed my tests the first time round. I’ve been putting off getting my licence for more than 20 years! Please pass on a special thanks to Graham and Rick. They really know their stuff and I feel they more than prepared me for the tests. I’m glad you (Nikki) suggested doing the training at the weekend so I could benefit from practicing in the MMA test area.